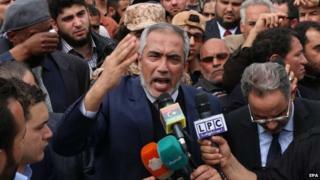 The leader of one of Libya's rival governments - backed by Islamists and based in Tripoli - has been sacked by its parliament, officials say. Omar al-Hassi was appointed in August to lead an alternative government after Islamist militia seized the capital. MPs voted to oust him on Tuesday following allegations he misled parliament about government finances. Libya has been in turmoil since the Nato-backed removal of former leader Muammar Gaddafi in 2011. The country has had two governments and parliaments since Islamist militia seized Tripoli in August and established the General National Congress (GNC) that was led by Mr al-Hassi. The seizure of Tripoli forced Libya's existing and internationally recognised government to flee to the eastern city of Tobruk. The rival parliaments have been holding UN-sponsored talks in Morocco in an attempt to end a period of lawlessness which many fear could strengthen militants allied to Islamic State. GNC spokesman Omar Humeidan told reporters Mr al-Hassi was removed after an investigation revealed he had exaggerated the government's revenues, amid complaints it could not afford to pay salaries. "The head of the government was dismissed by the parliament in a vote on Tuesday that was backed by the rest of the ministers," a member of the parliament told AFP. One of his Mr al-Hassi's aides, Khalifa Ghweil, has reportedly taken over as interim leader.